US President Barack Obama has announced a series of proposals to reduce gun violence, ranging from a proposed ban on military-style assault weapons to universal background checks. The proposals to tighten gun controls follows the shooting of 20 children and seven women by lone gunman Adam Lanza in Newtown, Connecticut in December 2012. The Second Amendment to the US Constitution protects the right of citizens "to keep and bear arms". However, restrictions on lawful gun ownership vary by state. On Tuesday, New York passed gun control laws that supporters say are now the tightest in the nation. The New York measures include a wider ban on assault weapons, a law limiting high-capacity ammunition magazines, and provisions to keep guns from mentally ill people who make threats. Some gun owners will also have to register them with authorities. In Arizona, handguns can be bought with an instant background check and carried without a permit (in certain places), whereas in Illinois, special ID is required and concealed weapons are unlawful. The vast majority of states do not require rifles or shotguns to be registered and no permit is needed to buy or carry them. Handguns are more tightly restricted, with 38 states requiring a permit for carrying. 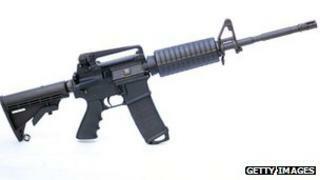 Only a handful of states still restrict semi-automatic "assault weapons", after a 1994 nationwide ban lapsed in 2004. New York and New Jersey ban assault weapons outright, as, in effect, does Massachusetts. Connecticut has a ban on assault weapons but some semi-automatic weapons can be possessed as long as they meet certain criteria. In California, assault weapons may not be sold, although existing weapons may be possessed if registered. They are banned in Chicago (although not the whole of Illinois), while Hawaii and Maryland ban assault pistols. Some 9,960 people were murdered with a firearm in the USA in 2010, a rate of 3.2 per 100,000 people. On a global scale, this rate puts the US 26th in the world, behind Honduras, El Salvador and Jamaica, according to UN data. However, when compared with other highly developed countries, the rate shows the US as an outlier. The US firearm murder rate has been fluctuating in recent years, from 3.9 per 100,000 people in 2006 to 3.2 in 2010, according to the UN. Different data from the FBI's Uniform Crime Report indicates that the 2011 rate is 2.8 per 100,000 but this varies across states. As shown below, DC is by far the highest, with Connecticut coming in below average at 2.6. Gun ownership across the country is falling, according to the comprehensive General Social Survey which regularly asks respondents whether their household or they themselves own a firearm. While some 46% of households and 29% of individuals said they owned a gun in 1990, two decades later this had fallen to 32% and 21%. One gun-owning household was that of Adam Lanza and his mother, Nancy. It has been reported that the weapons he used were all legally held by Mrs Lanza, who was her son's first victim on 14 December, 2012. They ranged from a semi-automatic rifle to hand guns.